For my next magic trick, I will conjour up a parking space! You sent them to college with a car and they are grateful. However, although it will make a weekly Publix run easier, no one really thought about the fact that parking at UCF can be pretty inconvenient and tends to be a problem every year. There are not enough spots for as many students who drive to campus. Unless you need your car (coming from an apartment complex), we highly suggest using the free UCF shuttles that go to almost every surrounding UCF affiliated apartment complex. In addition, many apartment complexes provide a shuttle to campus. My daughter claims it is easier and closer to her classes than trying to park, so she rarely brings her car to campus. Where do they expect students to park? Well, students can only park in D lots. However, after 5:30 pm and until 7:00 am, students are allowed to park in Faculty Lots B and C. Of course, students who live in Academic Village, Apollo, and Libra must purchase R permits (allows parking in lots B-8 and B-15, D lots and unreserved garages). Most importantly, be sure to leave yourself at least 30 minutes to find a spot. Students who live in the Towers at Knights Plaza must purchase KP permits. KP permits allow parking in garages E and G and all D lots and unreserved garages. Students who live in Lake Claire must purchase RL permits. RL permits allow parking in the Lake Claire and D lots. Note: This is where some students occasionally get in trouble. They come home late and just want to park near their dorm, so they park in Lot B or C and promise themselves that they will get up early and move the car before 7 am. In theory, it is a great idea because they have so much to do the next day and they can take a nap later. Their intentions are good, but they hit snooze too many times and by the time they get to move the car, the ticket is flapping in the breeze. They are rushing to campus from their apartment (or sometimes from one side of campus to the other) and although they planned to leave early that morning, their blow dryer wasn’t cooperating and now they must rush. When they get to campus, there are no spots available near their class and if they go to the other lots they will be really late, so maybe just this one time they won’t get ticketed. Besides, which is worse, walking in late again or another ticket? They loan their roommate/sorority sister/fraternity brother/friend from down the hall, their car and because the said friend doesn’t own a car, and are totally unaware of the parking situation on campus and park it someplace they believe is safe, but they are unknowingly wrong. Your student won’t realize this until the next time they go to use their car and by then there are five tickets; one for each day the car was parked in an unauthorized spot. Note: Do not park your car in reverse in the garage – you are more likely to get a ticket! All UCF students with cars need to register their car with UCF’s Parking Services. Passes are $50 for a semester and $100 for the full academic year, including summer. Passes for the new school year will become available August 6th, 2018. To get a parking permit, students will need their UCF email address, NID, and NID password, as well as the license plate number, issuing state, vehicle make, color, and year of their car. Students can choose between a decal (stick-on) permit, which is our suggestion because they are permanently attached to the vehicle. Hang Tag permits must be displayed on the rearview mirror and may be transferred between vehicles, but are more easily lost. Students can get more parking information and appeal or pay for tickets on the UCF Parking Services website. They can also find information on temporarily closed lots and car charging stations. $5.00 Daily Permit: Available at the Visitor and Parking Information Center. Daily permits are valid on all of the “D” parking lots and unreserved garages. The “D” parking areas are marked with green signs. Daily permits are also available at any of the pay stations located throughout campus. The pay stations accept cash (no change) or credit card. After 5:30 p.m. daily parking permits are $3.00. 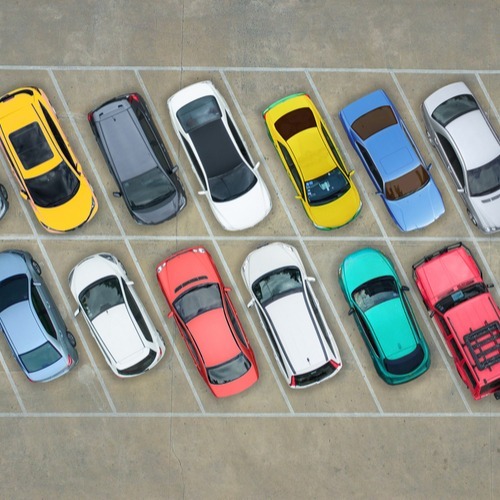 Short Term Parking: 1 or 2 hours timed pay-by-space spaces are located at the Visitor and Parking Information Center in parking lot B-6. Coin Meter Parking: Coin meters are located throughout the campus. Be sure to take note of the time limit posted on each meter location. Event parking differs a bit too. Information on event parking can be found here. If we have thoroughly confused you, we apologize, but we did start by saying parking tends to be a problem. Our advice; get a bicycle. Check out Park and Ride Services. Park by the Softball Stadium and the Park and Ride shuttle will drop you off right by HPA Monday-Thursday 9am-6pm. Personally, it is probably best to skip the car and use Lime bikes, available to students, employees and visitors on and off campus for 50 cents per half-hour.